Weed control is the botanical component of pest control, which attempts to stop weeds, especially noxious or injurious weeds, from competing with desired flora and fauna, this includes domesticated plants and livestock, and in natural settings, it includes stopping non local species competing with native, local, species, especially so in reserves and heritage areas. Weed control is important in agriculture. Many strategies have been developed in order to contain these plants. Methods include hand cultivation with hoes, powered cultivation with cultivators, smothering with mulch, lethal wilting with high heat, burning, and chemical attack with herbicides (weed killers). The definition of a weed is completely context-dependent. To one person, one plant may be a weed, and to another person it may be a desirable plant. In one place, a plant may be viewed as a weed, whereas in another place, the same plant may be desirable. Weeds compete with productive crops or pasture, ultimately converting productive land into unusable scrub. Weeds can be poisonous, distasteful, produce burrs, thorns or otherwise interfere with the use and management of desirable plants by contaminating harvests or interfering with livestock. Weeds compete with crops for space, nutrients, water and light. Smaller, slower growing seedlings are more susceptible than those that are larger and more vigorous. Onions are one of the most vulnerable, because they are slow to germinate and produce slender, upright stems. By contrast broad beans produce large seedlings and suffer far fewer effects other than during periods of water shortage at the crucial time when the pods are filling out. Transplanted crops raised in sterile soil or potting compost gain a head start over germinating weeds. Weeds also vary in their competitive abilities and according to conditions and season. Tall-growing vigorous weeds such as fat hen (Chenopodium album) can have the most pronounced effects on adjacent crops, although seedlings of fat hen that appear in late summer produce only small plants. Chickweed (Stellaria media), a low growing plant, can happily co-exist with a tall crop during the summer, but plants that have overwintered will grow rapidly in early spring and may swamp crops such as onions or spring greens. The presence of weeds does not necessarily mean that they are damaging a crop, especially during the early growth stages when both weeds and crops can grow without interference. However, as growth proceeds they each begin to require greater amounts of water and nutrients. Estimates suggest that weed and crop can co-exist harmoniously for around three weeks before competition becomes significant. One study found that after competition had started, the final yield of onion bulbs was reduced at almost 4% per day. Perennial weeds with bulbils, such as lesser celandine and oxalis, or with persistent underground stems such as couch grass (Agropyron repens) or creeping buttercup (Ranunculus repens) store reserves of food, and are thus able to grow faster and with more vigour than their annual counterparts. Some perennials such as couch grass exude allelopathic chemicals that inhibit the growth of other nearby plants. Weeds can also host pests and diseases that can spread to cultivated crops. Charlock and Shepherd's purse may carry clubroot, eelworm can be harboured by chickweed, fat hen and shepherd's purse, while the cucumber mosaic virus, which can devastate the cucurbit family, is carried by a range of different weeds including chickweed and groundsel. Insect pests often do not attack weeds. However pests such as cutworms may first attack weeds then move on to cultivated crops. Some plants are considered weeds by some farmers and crops by others. Charlock, a common weed in the southeastern US, are weeds according to row crop growers, but are valued by beekeepers, who seek out places where it blooms all winter, thus providing pollen for honeybees and other pollinators. Its bloom resists all but a very hard freeze, and recovers once the freeze ends. Annual and biennial weeds such as chickweed, annual meadow grass, shepherd's purse, groundsel, fat hen, cleaver, speedwell and hairy bittercress propagate themselves by seeding. Many produce huge numbers of seed several times a season, some all year round. Groundsel can produce 1000 seed, and can continue right through a mild winter, whilst Scentless Mayweed produces over 30,000 seeds per plant. Not all of these will germinate at once, but over several seasons, lying dormant in the soil sometimes for years until exposed to light. Poppy seed can survive 80–100 years, dock 50 or more. There can be many thousands of seeds in a square foot or square metre of ground, thus and soil disturbance will produce a flush of fresh weed seedlings. The most persistent perennials spread by underground creeping rhizomes that can regrow from a tiny fragment. These include couch grass, bindweed, ground elder, nettles, rosebay willow herb, Japanese knotweed, horsetail and bracken, as well as creeping thistle, whose tap roots can put out lateral roots. Other perennials put out runners that spread along the soil surface. As they creep they set down roots, enabling them to colonise bare ground with great rapidity. These include creeping buttercup and ground ivy. Yet another group of perennials propagate by stolons- stems that arch back into the ground to reroot. The most familiar of these is the bramble. Weed control plans typically consist of many methods which are divided into biological, chemical, cultural, and physical/mechanical control. In domestic gardens, methods of weed control include covering an area of ground with a material that creates a hostile environment for weed growth, known as a weed mat. Several layers of wet newspaper prevent light from reaching plants beneath, which kills them. Daily saturating the newspaper with water plant decomposition. After several weeks, all germinating weed seeds are dead. In the case of black plastic, the greenhouse effect kills the plants. Although the black plastic sheet is effective at preventing weeds that it covers, it is difficult to achieve complete coverage. Eradicating persistent perennials may require the sheets to be left in place for at least two seasons. Some plants are said to produce root exudates that suppress herbaceous weeds. Tagetes minuta is claimed to be effective against couch and ground elder, whilst a border of comfrey is also said to act as a barrier against the invasion of some weeds including couch. A 5–10 centimetres (2.0–3.9 in) layer of wood chip mulch prevents most weeds from sprouting. Gravel can serve as an inorganic mulch. 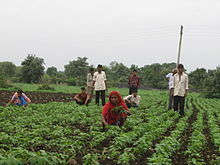 Irrigation is sometimes used as a weed control measure such as in the case of paddy fields to kill any plant other than the water-tolerant rice crop. Many gardeners still remove weeds by manually pulling them out of the ground, making sure to include the roots that would otherwise allow them to resprout. Hoeing off weed leaves and stems as soon as they appear can eventually weaken and kill perennials, although this will require persistence in the case of plants such as bindweed. Nettle infestations can be tackled by cutting back at least three times a year, repeated over a three-year period. Bramble can be dealt with in a similar way. A highly successful, mostly manual, removal programme of weed control in natural bush land has been the control of sea spurge by Sea Spurge Remote Area Teams in Tasmania. 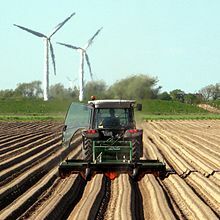 Ploughing includes tilling of soil, intercultural ploughing and summer ploughing. Ploughing uproots weeds, causing them to die. In summer ploughing is done during deep summers. Summer ploughing also helps in killing pests. Mechanical tilling can remove weeds around crop plants at various points in the growing process. An Aquamog can be used to remove weeds covering a body of water. Several thermal methods can control weeds. Flame weeders use a flame several centimeters away from the weeds to give them a sudden and severe heating. The goal of flame weeding is not necessarily burning the plant, but rather causing a lethal wilting by denaturing proteins in the weed. Similarly, hot air weeders can heat up the seeds to the point of destroying them. Flame weeders can be combined with techniques such as stale seedbeds (preparing and watering the seedbed early, then killing the nascent crop of weeds that springs up from it, then sowing the crop seeds) and preemergence flaming (doing a flame pass against weed seedlings after the sowing of the crop seeds but before those seedlings emerge from the soil—a span of time that can be days or weeks). Hot foam (foamstream) causes the cell walls to rupture, killing the plant. Weed burners heat up soil quickly and destroy superficial parts of the plants. Weed seeds are often heat resistant and even react with an increase of growth on dry heat. Since the 19th century soil steam sterilization has been used to clean weeds completely from soil. Several research results confirm the high effectiveness of humid heat against weeds and its seeds. Soil solarization in some circumstances is very effective at eliminating weeds while maintaining grass. Planted grass tends to have a higher heat/humidity tolerance than unwanted weeds. In 1998, the Australian Herbicide Resistance Initiative (AHRI), debuted. gathered fifteen scientists and technical staff members to conduct field surveys, collect seeds, test for resistance and study the biochemical and genetic mechanisms of resistance. A collaboration with DuPont led to a mandatory herbicide labeling program, in which each mode of action is clearly identified by a letter of the alphabet. The key innovation of the AHRI approach has been to focus on weed seeds. Ryegrass seeds last only a few years in soil, so if farmers can prevent new seeds from arriving, the number of sprouts will shrink each year. Until the new approach farmers were unintentionally helping the seeds. Their combines loosen ryegrass seeds from their stalks and spread them over the fields. In the mid-1980s, a few farmers hitched covered trailers, called "chaff carts", behind their combines to catch the chaff and weed seeds. The collected material is then burned. An alternative is to concentrate the seeds into a half-meter-wide strip called a windrow and burn the windrows after the harvest, destroying the seeds. Since 2003, windrow burning has been adopted by about 70% of farmers in Western Australia. Yet another approach is the Harrington Seed Destructor, which is an adaptation of a coal pulverizing cage mill that uses steel bars whirling at up to 1500 rpm. It keeps all the organic material in the field and does not involve combustion, but kills 95% of seeds. Another manual technique is the ‘stale seed bed’, which involves cultivating the soil, then leaving it fallow for a week or so. When the initial weeds sprout, the grower lightly hoes them away before planting the desired crop. However, even a freshly cleared bed is susceptible to airborne seed from elsewhere, as well as seed carried by passing animals on their fur, or from imported manure. Buried drip irrigation involves burying drip tape in the subsurface near the planting bed, thereby limiting weeds access to water while also allowing crops to obtain moisture. It is most effective during dry periods. Rotating crops with ones that kill weeds by choking them out, such as hemp, Mucuna pruriens, and other crops, can be a very effective method of weed control. It is a way to avoid the use of herbicides, and to gain the benefits of crop rotation. Organic weed control involves anything other than applying manufactured chemicals. Typically a combination of methods are used to achieve satisfactory control. Sulfur in some circumstances is accepted within British Soil Association standards. The above described methods of weed control use no or very limited chemical inputs. They are preferred by organic gardeners or organic farmers. Contact herbicides destroy only plant tissue that contacts the herbicide. Generally, these are the fastest-acting herbicides. They are ineffective on perennial plants that can re-grow from roots or tubers. Systemic herbicides are foliar-applied and move through the plant where they destroy a greater amount of tissue. Glyphosate is currently the most used systemic herbicide. Soil-borne herbicides are applied to the soil and are taken up by the roots of the target plant. Pre-emergent herbicides are applied to the soil and prevent germination or early growth of weed seeds. In agriculture large scale and systematic procedures are usually required, often by machines, such as large liquid herbicide 'floater' sprayers, or aerial application. See also Bradley Method of Bush Regeneration, which uses ecological processes to do much of the work. Perennial weeds also propagate by seeding; the airborne seed of the dandelion and the rose-bay willow herb parachute far and wide. Dandelion and dock also put down deep tap roots, which, although they do not spread underground, are able to regrow from any remaining piece left in the ground. One method of maintaining the effectiveness of individual strategies is to combine them with others that work in complete different ways. Thus seed targeting has been combined with herbicides. In Australia seed management has been effectively combined with trifluralin and clethodim. Resistance occurs when a target adapts to circumvent a particular control strategy. It affects not only weed control,but antibiotics, insect control and other domains. In agriculture is mostly considered in reference to pesticides, but can defeat other strategies, e.g., when a target species becomes more drought tolerant via selection pressure. Herbicide resistance recently became a critical problem as many Australian sheep farmers switched to exclusively growing wheat in their pastures in the 1970s. In wheat fields, introduced varieties of ryegrass, while good for grazing sheep, are intense competitors with wheat. Ryegrasses produce so many seeds that, if left unchecked, they can completely choke a field. Herbicides provided excellent control, while reducing soil disrupting because of less need to plough. Within little more than a decade, ryegrass and other weeds began to develop resistance. Australian farmers evolved again and began diversifying their techniques. Ryegrass populations were large, and had substantial genetic diversity, because farmers had planted many varieties. Ryegrass is cross-pollinated by wind, so genes shuffle frequently. Farmers sprayed inexpensive Hoegrass year after year, creating selection pressure, but were diluting the herbicide in order to save money, increasing plants survival. Hoegrass was mostly replaced by a group of herbicides that block acetolactate synthase, again helped by poor application practices. Ryegrass evolved a kind of "cross-resistance" that allowed it to rapidly break down a variety of herbicides. Australian farmers lost four classes of herbicides in only a few years. As of 2013 only two herbicide classes, called Photosystem II and long-chain fatty acid inhibitors, had become the last hope. Strategic weed management is a process of managing weeds at a district, regional or national scale. In Australia the first published weed management strategies were developed in Tasmania, New South Wales  and South Australian 1999, followed by the National Weeds Strategy in 1999. Internationally weed societies help link weed science and management. In North America the Weed Science Society of America (WSSA) is the major weed science learned body with European Weed Research Council and Council of Australasian Weed Society serving the same purpose in Australia and New Zealand. There are also regional weed societies in Australasia and North America. Wikimedia Commons has media related to Weed control. ^ Bleasdale, J. K. A.; Salter, Peter John (1 January 1991). The Complete Know and Grow Vegetables. Oxford University Press. ISBN 978-0-19-286114-6. ^ "Control methods". Department of Agriculture and Food, Government of Western Australia. Retrieved 11 December 2015. ^ "Tagetes minuta Muster-John-Henry PFAF Plant Database". pfaf.org. ^ "EVALUATION REPORT DECEMBER 2015 - Wildcare SPRATS volunteer weed eradication project". Tasmanian Parks and Wildlife Service. Retrieved 19 June 2017. ^ "Aquamogs". Retrieved November 22, 2018. ^ Research report of DLR Rheinlandpfalz, September 2010: Weed control in seed cultures, especially arugula, Author: Dr. Norbert Laun, Institute "Queckbrunnerhof", Schifferstadt (Germany). Viewed on 14. February 2011. ^ Ross, Merrill A.; Lembi, Carole A. (2008). Applied Weed Science: Including the Ecology and Management of Invasive Plants. Prentice Hall. p. 123. ISBN 978-0135028148. ^ Westerman, Paula R.; Liebman, Matt; Menalled, Fabián D.; Heggenstaller, Andrew H.; Hartzler, Robert G.; Dixon, Philip M. (June 2005). "Are many little hammers effective? Velvetleaf (Abutilon theophrasti) population dynamics in two- and four-year crop rotation systems". Weed Science. 53 (3): 382–392. doi:10.1614/WS-04-130R. ISSN 0043-1745. ^ Bohan D.; et al. (2011). "National-scale regulation of the weed seedbank by carabid predators". Journal of Applied Ecology. 48(4): 888–898. ^ "American Pastoral". Brown Alumni Monthly. Sep–Oct 2012. ^ "Weedplan, putting the pieces together : a Tasmanian weed management strategy / issued by the Ministerial Working Group for the Development of the Tasmanian Weed Management Strategy - Details". Trove. Retrieved 2018-09-11. ^ (N.S.W. ), Noxious Weeds Advisory Committee (1997). New South Wales weeds strategy : coordinating the fight. [Orange, N.S.W.] : NSW Agriculture. ^ Committee, South Australia Weed Strategy; Australia, Natural Resources Council of South (1999). A weed strategy for South Australia. [Adelaide : Natural Resources Council of South Australia]. ^ The national weeds strategy : a strategic approach to weed problems of national significance. Agriculture and Resource Management Council of Australia and New Zealand., Australian and New Zealand Environment and Conservation Council. [Commonwealth of Australia]: [publisher not identified]. 1997. ISBN 0642214018. OCLC 37565115. ^ "Australian Weeds Strategy". Australian Weeds Strategy. Retrieved 11 September 2018. ^ Cloutier, Daniel. "European Weed Research Society (EWRS) - Home Page". www.ewrs.org. Retrieved 2018-09-11. ^ "CAWS · The Council of Australasian Weed Societies Inc". caws.org.au. Retrieved 2018-09-11.